This cardiovascular workout involves short bouts of high-intensity exercise followed by slower recovery periods. The workouts will last about 30 minutes. Example: Sprinting on a treadmill for 30 seconds followed by 90 seconds of walking. Bodyweight training has been used for centuries as a form of resistance training. This training involves things like pushups, sit-ups and any other form of exercise requiring only bodyweight. Perfect for those on-the-go busy days when getting to the gym is not an option. Yoga is another type of workout that has been around for centuries. Here at The Fitness Center, we can cater to your skill level. New to yoga? No big deal. Come give it a try. 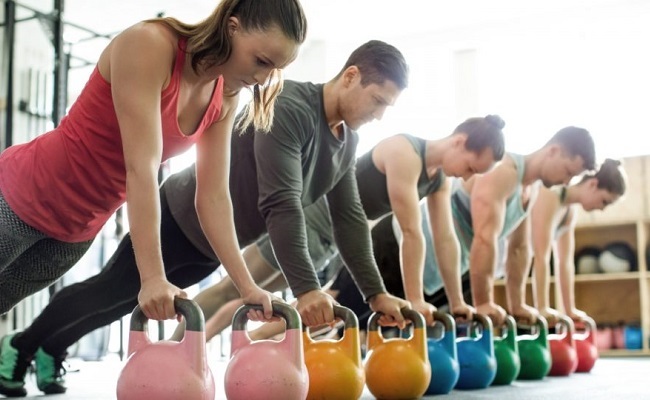 Functional fitness involves training for things like balance, coordination, and endurance to improve your ability to perform everyday tasks that might be involved in your job or at home. Personal training has been a staple of the Fitness Industry for quite some time and it will never go out of style. As a Fitness Professional myself, meeting with a personal trainer at least once will be beneficial to your exercise. Learning the proper way to perform exercise could make the difference between getting stronger and getting injured. Exercise has proven to be beneficial to maintain bone and muscle mass as people get older. Not to mention, The Fitness Center has classes that help our older adults stay in shapes such as Senior Chair Flair and Silver Sneakers. There is no one else better to motivate you to get to the gym than a gym buddy! Find a friend who has similar goals as you and team up! This will make coming to the gym and working out much easier. Plus, you and your gym buddy can get stronger together! It seems like every single day they are coming out with a new app to help you improve your health and wellness. Use these apps! A lot of them are free or inexpensive and they can help you track your progression as well as your diet. Some examples are the My Fitness Pal app and Runkeeper. Just like the apps, new wearable fitness technology comes out all the time. Fitness technology like FitBit, Samsung Gear Fit, and the Garmin Vivofit can all help you track your workouts. By letting you know your heart rate, calories burned and steps taken; these devices can help you bring your workout to the next level. The Fitness Center has everything you need to get your workout moving. Give us a call at (843) 785-3024 for more information. As always, make sure you consult with your physician and a fitness professional before beginning any new exercise. Take your workout to the next level in 2018 at The Fitness Center. Share your 2018 Fitness Goals with us on Social Media!